December 29th, 2013 | Pendragon Acres U.S. K-9, Inc.
Ernest Chainey awakens with a jolt, covered in sweat, shaking and convulsing in fear. His wife, Tammy, tries to comfort him, gently guiding him out of the night terror by speaking softly. And eventually Chainey calms down, his breathing becomes labored and he attempts to fall back to sleep. That scenario is all too common in the Chainey household since Ernest, 45, returned from three tours in Iraq. He was diagnosed with Post Traumatic Stress Disorder (PTSD) after his first tour in Iraq and medically discharged in 2012. Like so many other service men who served on the battlefield, Chainey came home after his final tour a changed man. He now battles a different war on friendly ground where the enemy has set up camp inside his head. “It has affected everything I do,” Chainey said. He hasn’t been able to find a job or provide for his family. He deals with deep depression, explosive anger and bouts of paranoia. Since the disorder is still largely misunderstood and not widely recognized as an actual disability, Chainey says he often feels he is fighting alone, but he should get some relief soon. Michael Giannetti, owner of Pendragon Acres U.S. K-9, stepped in to help Ernest and other wounded Vets live a better quality of life through the placement and training of assisted service and PTSD-certified canines. Pendragon Acres U.S. K-9 is an upscale breeder and trainer of German shepherds in Brooksville. Captain Giannetti, as he is affectionately known by his friends and colleagues, has made it his mission to help those in need by providing quality canines for protection and service. 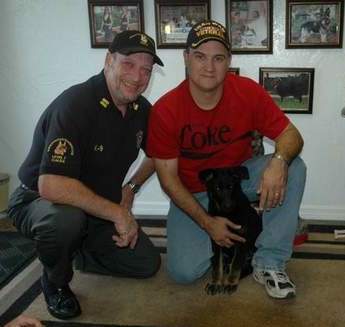 He embraced the chance to help Chainey after hearing of the soldier’s plight. The men were introduced through a local organization, Gifts From Home, that sends care packages to deployed soldiers on the front lines of battle. Chainey was one of the organization’s first recipients. Linda Kidwell, president of Gifts From Home, maintained contact with Chainey after he was discharged and returned to civilian life in Rogers, Texas. She and Giannetti began talking about Chainey’s desire to get a service dog to help his PTSD. A recent relapse that sent Chainey to the hospital for a psychiatric evaluation prompted Giannetti to call Chainey to tell him a canine was chosen for him. The Department of Veterans Affairs reports that 10 to 18 percent of Iraq and Afghanistan war veterans have post-traumatic stress disorder. Chainey struggled with the diagnosis at first. “I didn’t believe there was anything wrong with me,” he said. He finally accepted it after an episode that ended in police and firefighters arriving, he said. “I was crawling around on the grass,” he remembered. The most difficult part, he said, is the stigma attached to PTSD. “People think that everyone with PTSD is a psycho,” he said. It’s not the first time Giannetti has swooped in to help. Last year, when Ridge Manor resident Katherine Lockwitch lost her service canine, Baron, to a hit and run, Giannetti donated Tarlov, a solid black German shepherd male puppy, born just days before Christmas. He also helped raise the roughly $35,000 dog’s training. Giannetti will do the same for Chainey and his family, who arrived in Brooksville on Wednesday. Chainey’s new service canine was born just 12 weeks ago, a dark-eyed black and tan female with a curious disposition. She met Chainey, his wife and their three children, Lauren, 19, Elizabeth, 17, and Ernest Jr., 15 on Thursday when the bonding began. The family decided to name her Lady Guinevere. The official presentation will take place Saturday at the Tampa Cigar Festival in Cotanchobee Fort Brooke Park in downtown Tampa. Giannetti hopes is to bring awareness to the reality of PTSD in war veterans and identify once again the importance of correctly bred and trained German shepherds for assisted service and PTSD-certified canines. After the family bonds with the dog for about three weeks, Chainey will return to Brooksville and begin the long process of training her to be PTSD certified. She will be the second PTSD-certified assisted service canine bred and trained through Pendragon Acres. For Ernest Chainey, his life changed when he witnessed an ambush in Iraq that claimed the life of one of his fellow soldiers. Lady Guinevere will help his life change yet again. “Now he has something that every day he is going to have to live for,” Giannetti said.